The challenge in maintaining and repairing injection moulding machines is to guarantee high availability while at the same time reducing costs. This is where e-connect.monitor from ENGEL comes in. The condition monitoring solution makes it possible to check the condition of process-critical machine components during operation and reliably predict their remaining service life. In this way, unplanned downtimes can be avoided and the working life of the components fully utilised. ENGEL is successively expanding its condition monitoring range. Following the successful introduction of two modules for plasticising screws and spindles two years ago, ENGEL will be presenting two further modules for permanent monitoring of hydraulic oil and hydraulic pumps at Fakuma 2018, from 16 to 20 October in Friedrichshafen, Germany. With increasing operating time, the water content and the particle concentration in the hydraulic oil increase and can lead to wear or failure of the hydraulic components. Chemical oil ageing is another factor that makes it necessary to check the hydraulic oil regularly. e‑connect.monitor by ENGEL now makes it possible to monitor the quality of the hydraulic oil online with the aid of sensors in the oil circuit. This eliminates the need for time consuming, manual oil checks. The user receives recommendations on filtration time and duration and is able to precisely plan the oil change based on the current condition of the oil. Monitoring oil quality also ensures early detection of critical conditions and thus averts damage and unplanned failures. The pertinent test data is recorded during ongoing production, transmitted to ENGEL via a secure data connection, and automatically evaluated and interpreted there using specially developed mathematical models. The results are immediately visible in the ENGEL customer portal e-connect. 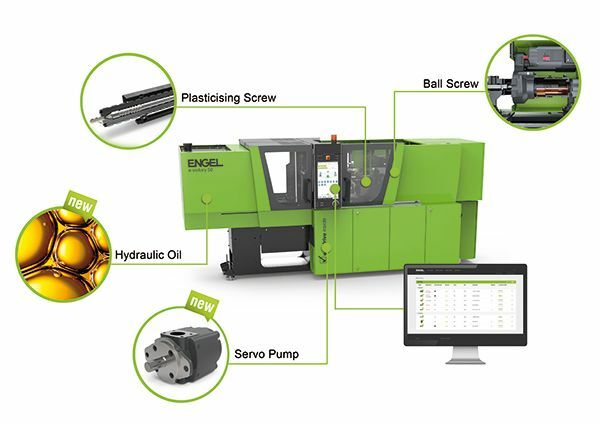 Not only the hydraulic oil can now be monitored using e-connect.monitor, but also the fixed-displacement pumps in servohydraulic ENGEL injection moulding machines. The efficiency of the pumps decreases continuously over their service life and energy consumption increases. As a rule, plastics processors only notice a critical pump condition when the machine cycle changes significantly or when the machine fails. ENGEL therefore began at an early stage to build up its own pump expertise. Test runs on pump test beds and monitoring of various pumps in ongoing production provide the data from which the ENGEL experts model the algorithms that precisely and conveniently show the customer the condition of their pumps. With the help of e-connect.monitor, the pump data is automatically recorded and analysed without affecting the production process. The results are displayed in the e-connect portal as an easily understandable wear value. This gives the user a basis for deciding whether and when to replace the pumps. e-connect.monitor with four modules – for plasticising screws, ball screws in high-performance electric machines, hydraulic oil and hydraulic pumps – is currently the only system on the market that allows condition-based and predictive maintenance of injection moulding machine components. As a first step, the two new modules for monitoring hydraulic oil and pumps will be offered for injection moulding machines of the current CC300 control generation. Retrofit solutions for older control generations are in preparation. The increasing systematic utilisation of machine data and the networking of production systems open up new opportunities for the injection moulding industry for even higher productivity, efficiency and quality. Under the name inject 4.0, ENGEL already bundles a large number of products and solutions for the smart factory. In the smart service sector, ENGEL offers its customers sustainable added value with e-connect.monitor and will continue to expand this in the future.